Discussion in 'Current Events' started by akphidelt2007, Jul 19, 2016. I usually don't buy in to these, but the similarities are very very difficult to overcome. The odds of these exact words coming out is very slim. I just can't imagine someone that being that dumb if this is true... but it is pretty weird. Trump: ...the values that you work hard for what you want in life. Obama: ...that your word is your bond, that you do what you say youre gonna do. Trump: ...that your word is your bond, and you do what you say and keep your promise. Obama: ...because we want our children and all children in this nation to know the only limits on the height of your achievements is the reach of your dreams and your willingness to work hard for them. Trump: ...because we want our children in this nation to know that the only limit to your achievements is the strength of your dreams and your willingness to work for them. I do. I think it's terrible. lulz. if that's plagiarizing, then Obama's "you didn't build that" screed was lifted directly from Squaw Warren. Treating people with respect is now plagiarizing. Some people have nothing better to do. I agree. Obama's speech was almost a mirror image of Warren's. I guess there's only so many ways to convey similar ideas, huh? When did Michelle say, ".I was born in Slovenia, a small, beautiful and then communist country in Central Europe. My sister Ines, who is an incredible woman and a friend, and I were raised by my wonderful parents. My elegant and hard-working mother Amalia introduced me to fashion and beauty. My father Viktor instilled in me a passion for business and travel. "? It is when you include everything else in equal succession. But I know conservatives aren't the most honest people. If you want to deny the obvious and lie to yourself, feel free. Doesn't surprise me. Who cares? Melania is a stone-cold goddess. Speaks 7 languages runs her own business and is a former successful model. She said 'no room for small thinking'.....Bound to make libbie men pee their pants. Shades of the 1988 Biden/Kinnock plagiarism controversy. Lol, Hillary isn't a conservative. People who care about honesty. Shows how bad of a leader Donald is. My advice to hand wringing liberals is to not vote for her. easy peasy. I can't even imagine if Michelle plagiarized Nancy Reagan's speech. There'd already be 10 republican hearings. 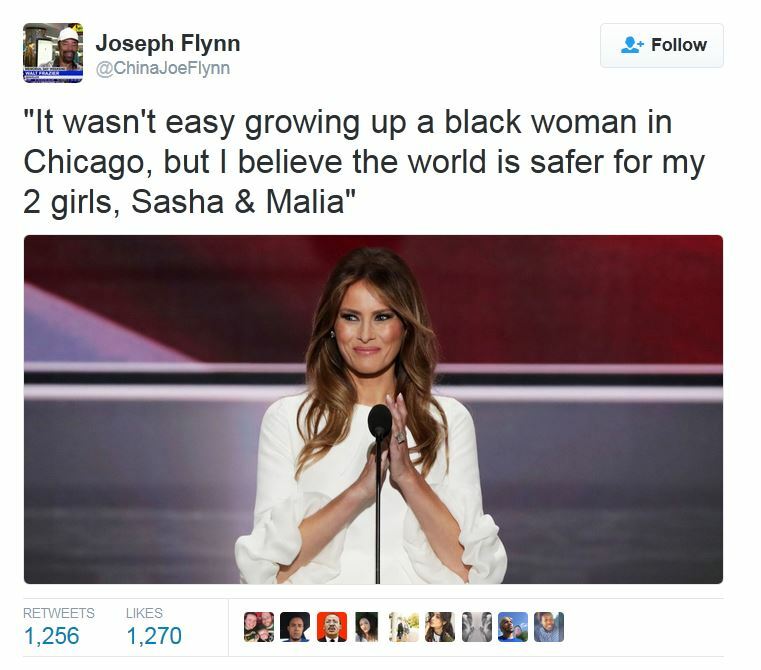 Is Michelle responsible for the deaths of 4 American's too? Why do you care and what's so terrible about her wonderful speech? No, but Bush and Cheney are directly responsible for the death of at least 8000 Americans...but in right wing whacko world, only Benghazi deaths count. Congress has the power to declare war, not the President [US Constitution, Article I, Section 8, Clause 11]. Hillary voted yes, if you want to put those deaths on her too I'm fine with that. Congress has the power to declare war, not the President. Hillary voted yes. Bush's bonehead national security team picked their noses while 3000 Americans perished on the streets of New York. Congress has not declared war since 1941. What HC and almost every Republican voted for was the right for Bush to go to War as a last resort. Bush/Cheney lied us into that idiotic war according to GOP standard bearer Donald J Trump. 100% approved because the false and misleading information they were provided by Bush and Cheney. Let's not be so partisan here, lol. As if Hillary sits in her room drawing Embassy security plans next to a secret CIA base, lol. The dishonesty of you guys is sickening. You mean Hillary was duped by that idiot Bush? It's obviously plagiarized. Anyone with an IQ over 60 could figure that out. But conservatives are dominated by the uneducated for a reason, lol. Most Trump supporters IQs hover in the mid 50s, just below imbecile but above idiot.